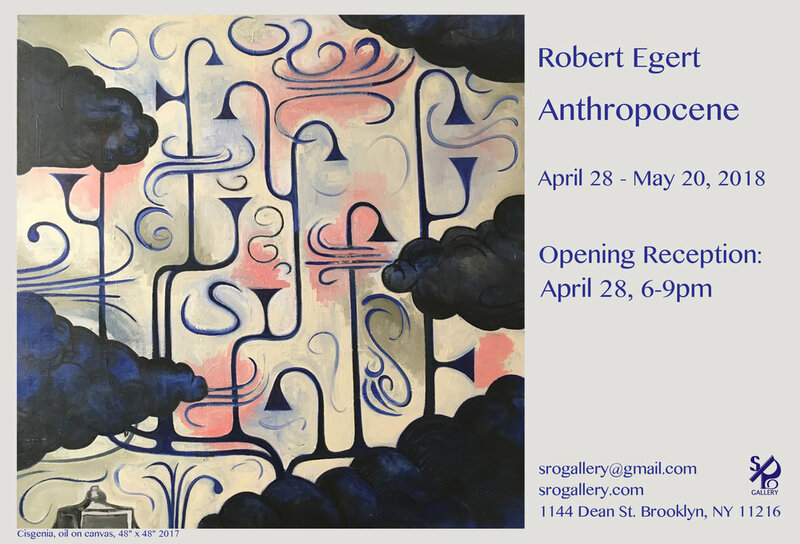 SRO GALLERY is pleased to present an exhibition of paintings by Robert Egert: Anthropocene. Opening Reception April 28, 6-9pm. The exhibit will be on view through May 20, 2018. "...full of magma energy, wit, and speculations on the body, on science, on nature mimicking art. His images are Darwin's dreams, Philip Guston's party-jokes, or Frida Kahlo's sighs of grief." 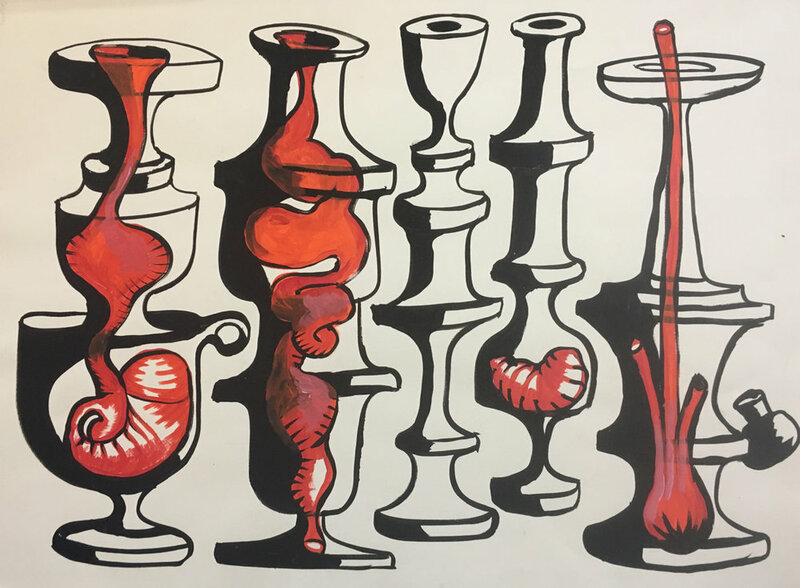 In his most recent paintings shown here at SRO GALLERY, Egert's mathematical surfaces and classically inspired vessels morph into worlds of their own. While they suggest classical influences, these paintings move the viewer towards contemplations of the future. The forms in his paintings place the viewer in a position where it is possible to stand before the scene of natural landscape, architecture, (in one painting, a collection of vessels that seem to carry the source of life), or dive back into the distance of these scenes, in an attempt to gather more information and question where in his invented world we prefer to stand. In some we look through passages to find familiar mechanics. Pipes form an imagined sort of plumbing - conduits of our changing natural, industrial and AI environment perhaps. We wonder at the connection between the familiar and the unknown. There is nature, science, architecture and archeology found in all the paintings. The works on paper suggest chemical reactions in nature, forms of the human body are felt, as if we are all subject to spontaneous happenings. We feel the interior and the exterior simultaneously. Robert Egert was born in Brooklyn, NY in 1958 and studied paintings at Pratt Institute with Autonomia founder Ernst Benkert and sculptor Ursula von Rydingsvard. He later obtained a graduate degree from City University Graduate Center with a focus on critical theory. Egert began exhibiting his paintings in New York in the 1980s with his first solo exhibition at White Columns gallery. Shortly thereafter he joined Civilian Warfare, one of the galleries that launched the emerging East Village art scene. 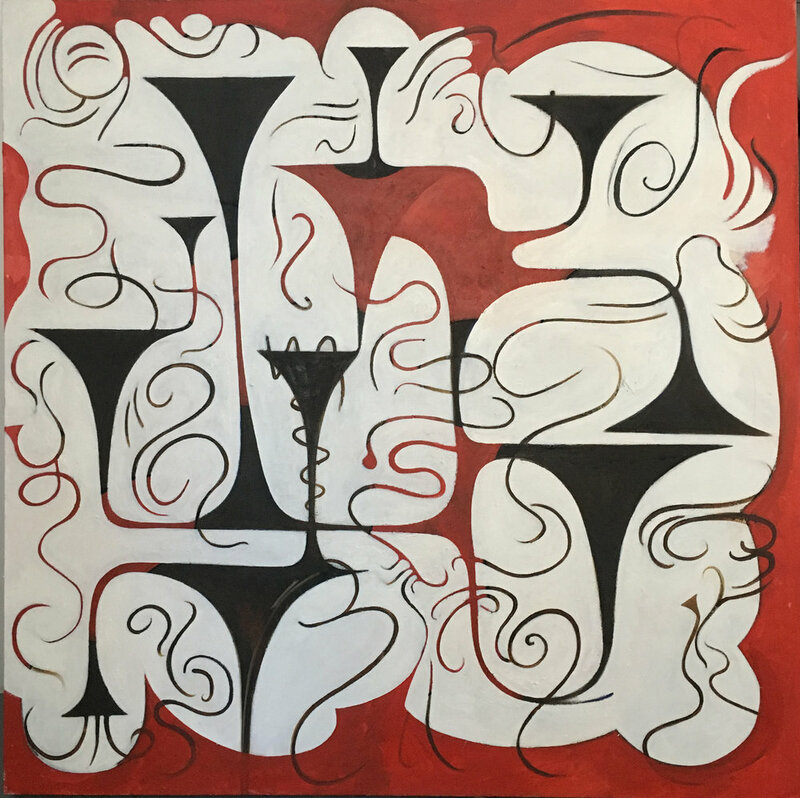 Most recently, his work has been featured in solo exhibitions at Fred Valentine Gallery, Ethan Pettit Contemporary Art, Holland Tunnel. and Rockland Center for the Arts, all in New York.